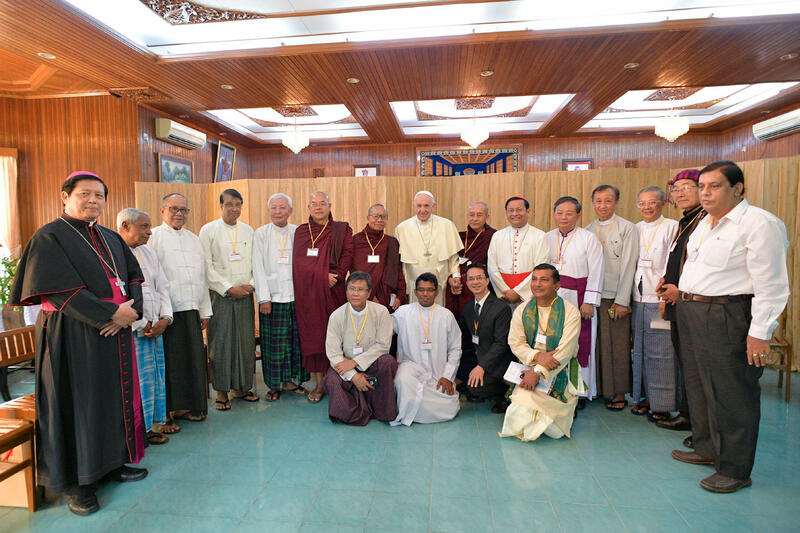 On November 28, 2017, the second day of his Apostolic Journey to Myanmar, Pope Francis met the country’s 17 religious leaders – Buddhists, Muslims, Hindu, Jews, and Christians, at the Archbishopric of Yangon. Lamenting before them the “global tendency to uniformity,” the Holy Father advocated “unity in differences.” “We are brothers,” he stressed. This meeting, which took place in the Archbishopric’s Refectory, began at 10:00 am (4:30 a, in Rome) and lasted some 40 minutes. Each of the participants took to the floor briefly. According to a Holy See press release, the main theme was that of unity in diversity. The Pope, whose words were pronounced with a full heart in Spanish, stressed – quoting the Psalms: “That it is good to see brothers united.” “United doesn’t mean identical. Unity isn’t uniformity, including within the same Confession. Each one has his values, his riches and also his shortcomings,” he specified, as reported by Vatican Radio. The Vatican gave a list of those present at the meeting: Ashin Aria Wonthar Biwontha of the Myawaddy Min Gyi monastery; Buddhist monk Asia Alin Sayadaw; the President of Botahtaung Sankhnayaka, Sayadaw U. Thila Wontha; the Vice-Rector of the International Wipathanar University, Sayadaw Dr. Thondara; the President of Religions for Peace and the Buddhist Yadana Metta Development organization, U Myint Shwe; the Chief Convener of the Islamic Center of Myanmar, Ahah khaliphosh U Aye Lwin; the President of the Islamic Religious Affairs Council, Ahah U Nyunt Maung Sheine, the President of the Islamic Center of Myanmar, Ahah U Khin Maung Myint; the Secretary of the All Myanmar Hindu Centre Council, U Kyaw Thu; the Secretary of the Hindu Drama Shiksha Samiti, Sann Min Naing; the Catholic leader Robert Manam Tu Ja of the state of Kachin; the President of the Council of Churches of Myanmar, Patrick Loo Nee; the Anglican Archbishop of the province of Myanmar Stephen Than Myint Oo; the Secretary of the Public Relations Committee of the Baptist Convention of Myanmar, the Reverend Mahn San Thein Tun; the Patron of the Myanmar Prayer Committee, the Reverend Aung Thet Nyunt; the Secretary of the province of the Church of Myanmar, the Reverend Paul Myint Htet; and the head of the Jewish community Sammy Samuel.